Located on Cowper Street in Shoreditch (as if the name wasn’t a big enough give away) the Shoreditch Butchery is the latest in a long line of places offering American diner-style food alongside a selection of cocktails, beers and wine. What used to be the XO bar has been transformed into an informal dining space; dimly lit, booths line the walls and a collection of small tables dot the room. In one corner stands the DJ booth and opposite the bar. Speaking with a couple of the PR girls there about the Shoreditch Butchery and it’s role within the XOYO club as a whole we were told, ‘we want the SB to function as a room on its own. We want people to come in, have food and a cocktail then realise they want to and can stay out and make their way downstairs to the club. The room isn’t just another room in the club - it has it’s own personality. People can be downstairs in the club, then come up here, chill out and have a cocktail’. 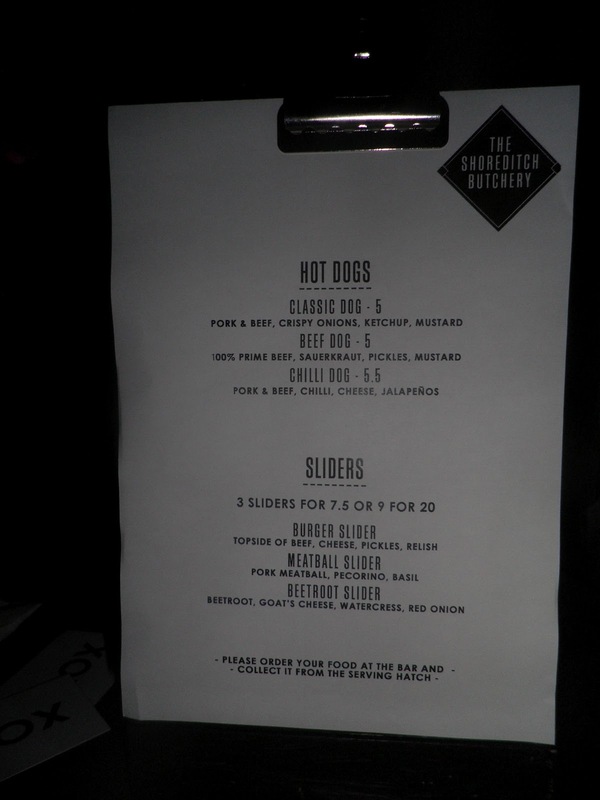 Opening night at The Shoreditch Butchery took its toll on service, I arrived around 8pm and although keen to sample and review the range of sliders, hot dogs and cocktails on offer, I had to repeatedly ask to be served! The dogs are sourced from Abiye of Big Apple Hot Dogs fame, so no complaints there. 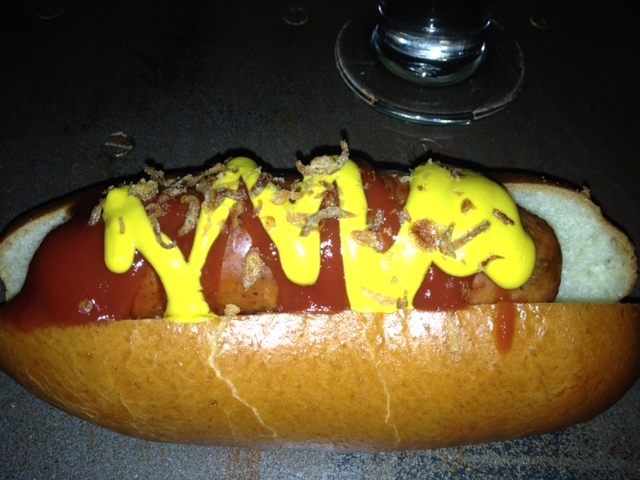 The Classic Dog worked the best; a simple topping of crispy onions, ketchup and mustard. 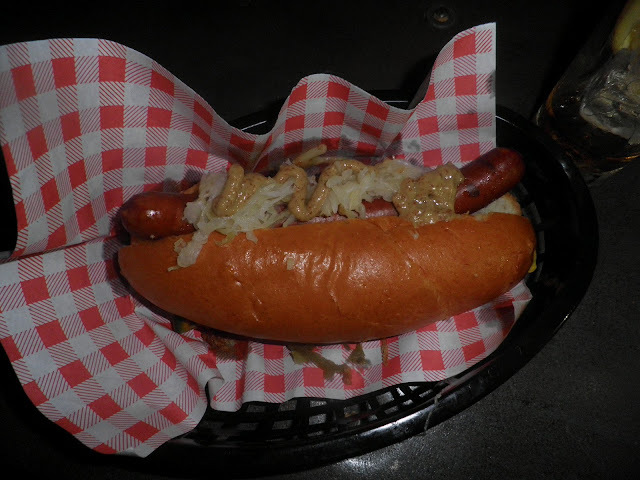 The Beef Dog’s sauerkraut didn’t stand out enough and was completely overpowered by the wholegrain mustard. Looking at the menu now, it says it comes with pickles though I don’t recall there being any on the dog. The Chilli Dog was fine but there was not nearly enough chilli topping. Plus, maybe it’s just me but do you need kidney beans in a chilli if it’s being used as a topping? There was also the issue of the cheese which covered the dog and what little chilli there was in a strange creamy blanket, but more on that later. However, the buns were an issue. According to the press release they are ‘freshly baked every day to our own recipe by the Flour Station in North London’. Between you and I, I think the Flour Station need to do a little work on their recipe. While they are trying to recreate Miller’s buttery brioche buns, these seem to fall short. Heavy, doughy with an almost bagel like taste; you want the meat to be the star of the show with the bread complimenting this. As it was, we each ended up leaving a good ¼ of the buns after finishing the dogs. Once I got my hands on the goods, I had a hot dog and the meat is really quite delicious, but for me it’s surrounded by too much bun that’s too dry. 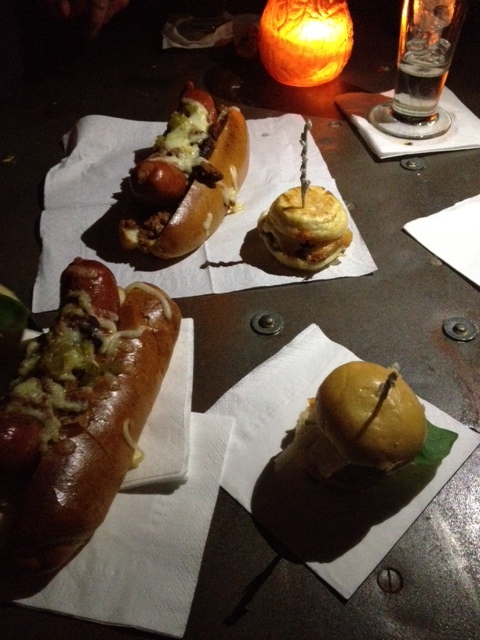 The menu is brief; 3 dogs and 3 sliders. 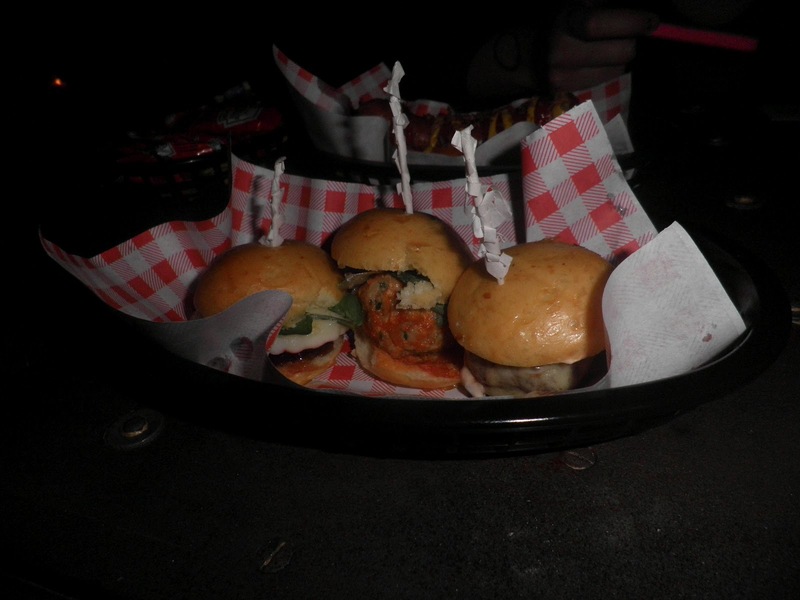 We start with the sliders which are served in dinky little diner-style plastic baskets. We start with the beef which is nice enough but I find the taste a little off. I can’t quite put my finger on what it is until later on when we try the chilli dog; it’s the cheese that both have come smothered in. It’s creamy and gummy but has a bizarre taste. We ask the chef what kind of cheese he’s using and are told it’s just processed cheddar. He gives us each a slice to try and sure enough it is but it tastes radically different to the melted cheese we had sampled earlier. But I digress. The meat in the burger patty was fine, however I did find two small pieces of gristle in my half slider which, given the size, isn’t great. Topped with a leaf of basil and a shard of pecorino, the pork meatball was by far my favourite. While lacking in juiciness it certainly delivered on flavour. The beetroot and goats cheese slider was a lovely combination and one any vegetarian would surely not feel short changed receiving. It was a little sloppy to eat and I did end up with a handful of onion chutney but it was a happy handful. The sliders on the other hand are good, and I sampled all three! 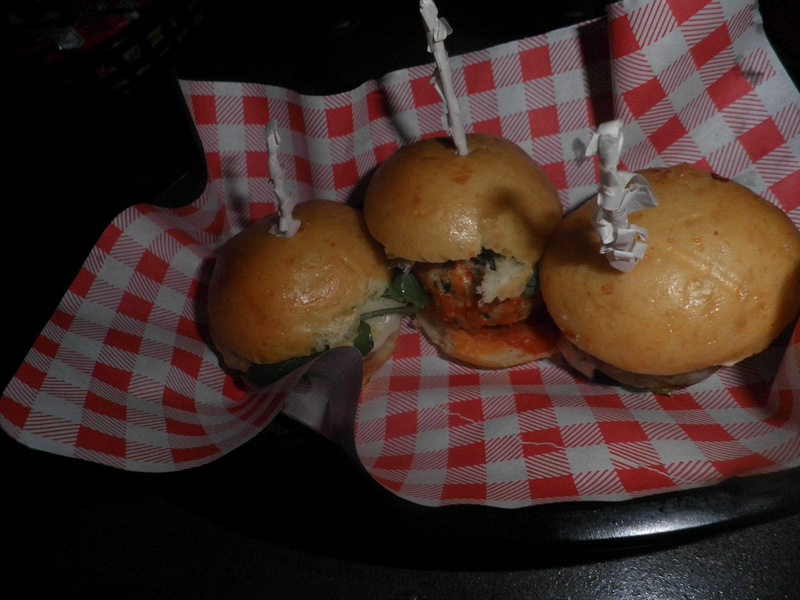 The ‘Burger’ slider, the ‘Meatball’ slider and the ‘Beetroot’ slider. 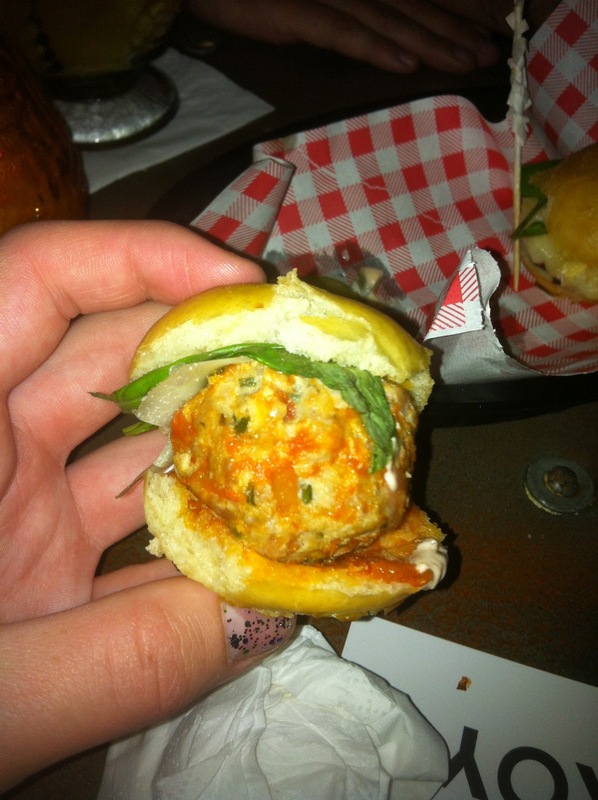 For me the burger was the clear winner, essentially a mini juicy little number – and I think it’s perfectly acceptable to have nine for £20 - they are stupidly moreish! The drinks menu is short but sweet. As we are there on business we make sure to try out each of the cocktails. 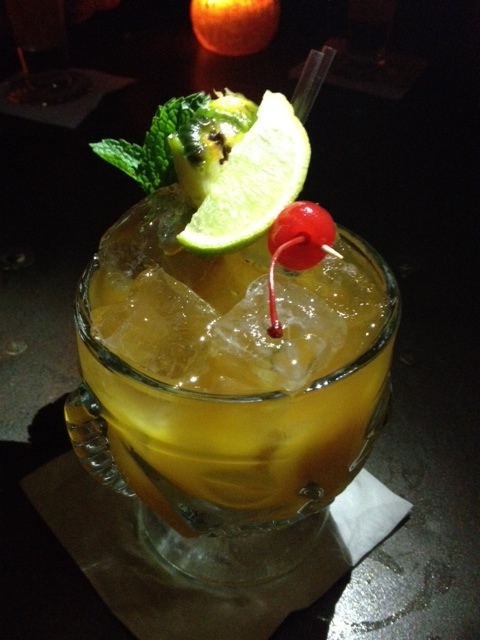 The first we try is the aptly named 'Big Tropical Rum Drink', a blend of '5 rums, fruit juices, bitters and voodoo'. 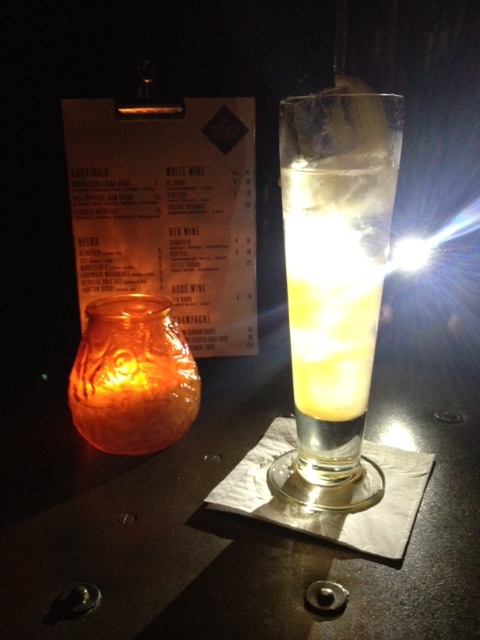 It’s a pleasant enough drink, served in a Tiki head goblet which I can’t help but want to pocket. The drinks are all premixed which saved time while at the bar but meant that they didn’t taste too alcoholic. Saying that, the Tequila Aperetivo almost blew my head off; I think next time I’ll stick with the Vodka Something Girly, a pleasant mix of vodka, Aperol and soda garnished with passionfruit. Unfortunately the cocktails I sampled, the Vodka-something-girly and the big tropical rum drink, were reminiscent of those I drank when I was a teenager, perhaps even in Magaluf! For me they were too sweet, with no real kick. The Shoreditch Butchery has the benefit of being next to XOYO so it makes for a good pre-night out venue, I'd line your stomachs with the sliders but I'd swap the cocktails for a beer, but there are better cocktails bars and burger joints to choose from. So would I go back? The answer to that is yes, if I was in the area I probably would. The drinks are reasonably priced and the food is nice but I can’t see myself going out of the way to visit for it especially. I think with a few tweaks it could be much better but then it is essentially bar food – food to snack on while you’re out drinking or to soak up the booze at the end of a long night. There’s nothing wrong with that of course, but it does make me question the venue’s angle: is it just a bar with a kitchen attached to it or is the kitchen supposed to be the main focus? So there you have it folks. Big thanks to my intrepid burger adventurers, and I leave you with details of the where and the when.